Have you ever wished for a warm and cozy spot in your home? A place not only enables you to spend precious time with your loved ones as well as one that assists to beautify your home until it becomes the envy of others. How an outdoor fireplace sounds? This is currently the most sought after trend in modern homes. It is one of the finest ideas to turn one’s courtyard or backyard into a livelier and fun place to be in all year round. All it takes is a meticulous planning together with the right tools and materials to get it up and going. You can try it out yourself today by following the step by step guide on how to build an outdoor fireplace suggested below. First and foremost, look for a strategic and favored spot of where you would like the fireplace to be located at. Do proceed with some research beforehand whether you will need to go by the city’s codes and ordinances like obtaining a permit in order to construct an outdoor fireplace in your home. It is advisable to pick a location which is far away from your home, trees, plants and other easily burned structures. This is to prevent unwanted accidents and fires due to some fire sparks that can easily cause fire. You can opt to allocate some seating places too provided there is sufficient clearance between the seats and the fireplace. Thus, the seats should be at least three meters away from it to prevent any fire disaster. If you would like to save some time, you can just get hold of a pre-fabricated fireplace that comes with safety measures in mind. Next, you can prepare the area where you have chosen to have the fireplace installed. Remove any dry leaves or plants that may cause hazard. You can construct a platform for the fireplace with the help of either cinder blocks or concrete. Tiles can be arranged along the border too to make the place look more attractive. For the fireplace installation, a pre-fabricated one can be built without much hassle. You will just need to follow the assemble instructions given by the manufacturer that come attached with the fireplace set. 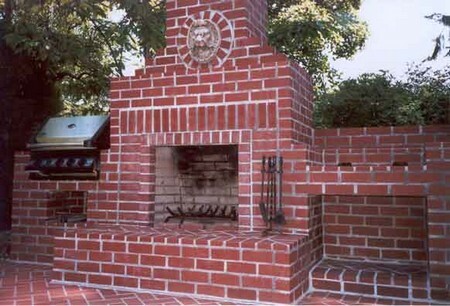 Since you are building an outdoor fireplace, there is need for a chimney more than a damper. Therefore, the chimney should be built as tall as possible and the fireplace opening to be lower to prevent excessive wind from entering the fireplace. Lastly, you can proceed to test out your newly built fireplace. Based on your creativity, you can further improve and enhance your fireplace by adding interesting finishing touches to it. You can adorn it by using bricks, blocks, cement, stained concrete, rocks, and tiles or even paint it with any color you like. For extra precautions, do setup a fireplace screen. If you intend to use the fireplace in future, prepare by putting some firewood into the hearth. Consider this an inexpensive way to enhance the euphonious atmosphere in your home.